Many ideas crossed my mind as potential rewards for completing our 21-Day Challenge. They ranged from treating myself to a juice cleanse or a spa treatment to purchasing a new piece of jewelry or splurging on clothing from one of my favorite shops. Ultimately, I decided on something more permanent, something that would honor my yoga practice and also serve as a symbol of my commitment to a vegan lifestyle. On Saturday night, for the first time in almost eight years, I got a new tattoo. I decided to place it a bit more conspicuously than my others, on my right inner wrist. It felt appropriate. This way I’ll see it often and be reminded of its meaning as I try each day to live it more fully. And, should someone ask its significance, it’s something that I will be more than happy to explain. 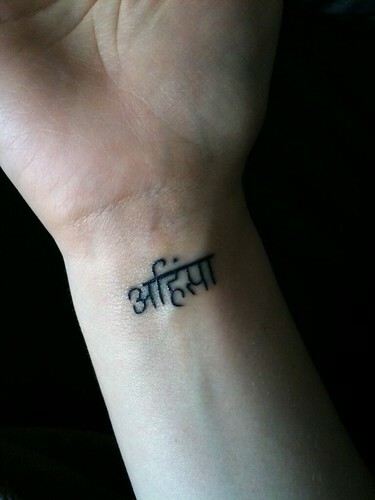 The simple black lettering that now lives on my wrist is the Sanskrit form of the word ahimsa. Ahimsa is one of the yamas, or ethical imperatives, of yoga, and means “to do no harm.” It is the first of the yamas and is often said to be the most important, since, if you are practicing ahimsa, all the others are encompassed by this. Having this word etched into my skin will be a constant reminder to live compassionately, to always strive to do the least amount of harm I can to myself, to the planet, and to all living beings. Both veganism and yoga, in various ways, help me to work toward all of the above, and I’m certain I will discover new ways to practice ahimsa more fully throughout my life. While I have no expectations of ever being perfect, I feel profoundly that ahimsa is worth striving for. Additional fun fact: the tattoo itself is vegan! Did you know that most aren’t? Many tattoo inks contain animal-derived glycerin, and black inks usually contain bone char or insect-derived pigment. Yeesh! It would have been pretty silly for me to get a bone char tatt to celebrate my veganism. If you’re looking for a vegan tattoo in NYC, White Rabbit Tattoos in the East Village is where I went. This 100% vegan shop has a funky, vintage vibe with antique mirrors and a drippy chandelier. Their main artists do really fascinating work (Jes has an especially unique portfolio), but they book up quickly. Since I wanted my tattoo sooner rather than later, I had it done by their current visiting artist Nate Osborne. He was really kind and careful, and patiently resized and repositioned the tatt several times for me until it was just right. I couldn’t be happier with the result. I feel like it came out well, but, more importantly, it is a meaningful symbol of practices that have become really significant in my life: yoga and veganism. And I will continue to strive for ahimsa by exploring these things more deeply every day. brought tears to my eyes. Beautifully inspiring and heart warming! I’ve been wanting to get that imprinted on me for years, and you’ve finally convinced me to DO IT! Thanks Britt! You are an inspiration!! LOVE IT! How exciting! Keep me posted–I can’t wait to see. Why, I think you’ve got It! The purpose to your being here and following ahisma. Boy, are you lucky, I am still trying to figure out why I am here, hope I can become enlightened soon! p.s. please make more pizza…soon!